The Fourth of July is days away, so let’s talk about what to wear for the holiday. I always want to dress festively for the Fourth, but don’t want to end up looking like an American Flag. To avoid this, I try to only wear only two of the three red, white, and blue colors. Since white has been one of my favorite colors to wear this summer, I knew I wanted to wear white and this matching set was the perfect option. 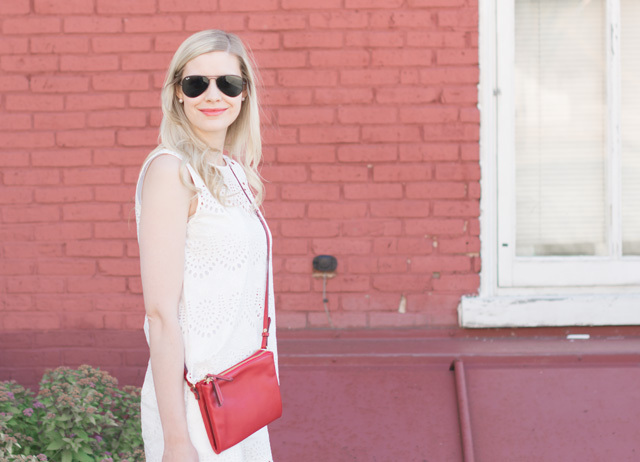 I paired it then with a red lip and cross-body to add a pop of color and make the look Fourth of July ready. I definitely agree sometimes when you try to pair all three colors it almost looks a little too festive rather than stylish! Love the outfit!